Caroline on Tour with High School Nation! Watch out West Coast! 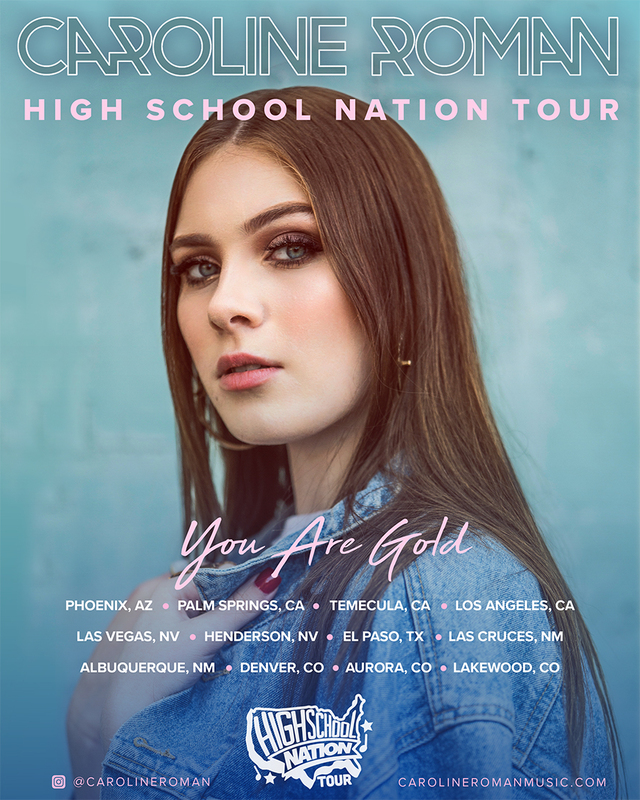 Caroline is coming to you via High School Nation for 5 weeks during the first part of their spring tour! At a time when “photo-shopped” images are the unattainable goal by which we measure ourselves, Caroline Roman’s new song “Gold” delivers a much welcomed message about how everyone is already “perfect” in their own way. Her vibe is relaxed, retro and “LA-beachy” which is reflected in her clothing style and her fun, pop musical hooks that will keep repeating in your head! She is an international award winning songwriter and has excited audiences as large as 4200.” As a performer, she demonstrates an amazing maturity and confidence on stage by engaging the crowd in the message and the music. She has been featured as Vocalist of the Month by Singer Universe and is currently ranked #1 in the Southeastern U.S. as “up and coming” unsigned “Pop” music artists by “Reverbnation”. Her debut single, “Heat of the Summer” received over 100K plays upon release, and fans are anxiously awaiting the release of her first EP “Gold” which was produced by the Grammy-nominated team at Bravo Ocean Studios known for their work on Katy Perry’s album Teenage Dream as well at Mariah Carey, Elton John, and several other well-known artists.